In ‘good’ news pictures, the kinds of news pictures that Life liked to publish, landscapes are the stable, uneventful settings for the momentary and aberrant foreground disruptions that constitute the news. In the two of Elisofon’s pictures that were allotted full pages for Life’s “Japanese Carry War to California Coast” report of March 9, the Santa Barbara landscape retreats to its proper journalistic role as backdrop, and very much by design: first, as stage for a shell fragment held aloft by Morris; and second, as the smooth, rolling topography out of which a cavity has been dug by an errant Japanese round, here guarded by an attending soldier. It is precisely these munitions and the damage they do that had set Morris and Elisofon in motion, and these pictures inscribe the more visually manifest markers of war onto this otherwise still-peaceful landscape. Morris, an almost unparalleled figure in the early codification of value in photojournalism, has clear ideas about the proper subject of a Life news photograph. The single most important priority here was not geographic exposition but narrative clarity and proprietary exclusivity. Irritated at once by the sight of the legion of camera reporters already on the scene, Morris pursued instead an object that might be removed from the otherwise sealed “battlefield,” pried his photographer from a friendly discussion of equipment, and staged a view of maximum communicative efficiency if uncertain bond to its site. If Elisofon is photographing a Japanese shell fragment pulled from the Goleta earth, for Morris the thing held firm in hand is all the more precious for being a scoop! A full mile over the target, this neat crater, scooped in the soil by a 5-in. shell which failed to explode, appears extrinsically to condemn the accuracy of the [Japanese] gunners, who were firing from a mere half mile from shore. Actually their miss was a good deal less than a mile. Their target was the flat oil storage tank visible above, a little to the left of center. Firing at point-blank range, the [Japanese] had their gun trained in almost level trajectory. Skimming the top of the tank by a few feet, the shell simply kept going until it struck the rising slope of this coastal meadow. Elisofon’s photographic field is shown to be determined by the precise span of the shell’s trajectory, and we are invited to assume a forensic gaze, sighting our line from the foreground divot to the roof of the white storage tank in the middle distance (just to the left of the trees near the waterline) and on finally to the shell’s point of origin beyond. While the great western landscape has not been so badly torn here, the conditions of visibility have been forcefully restructured, the beholder’s perspectival sightline recoded as a shell’s deadly path. Where the Westward picturing of the California landscape might have once suggested the mastery of all that one can see, here now it served as index to nothing other than the full, panoramic reach of the beholder’s own vulnerability. The once restful business of sitting in a Santa Barbara meadow gazing out over the Pacific would, from this point forward, the picture declares, be anything but a quiet, meditative act. The position from which Elisofon made his picture was now not only a battlefield, but, in the eyes of the Santa Barbara Sheriff’s Department, a crime scene. Ralph Bradford, untitled (Ellwood Shelling), 1942 | Courtesy of Paul Petrich, Jr. It could well be that one of the photographers Elisofon was talking lenses with that morning was SBSD crime scene photographer Ralph Bradford, also on the scene and whose own exacting record of the attack, above, was made the same day. Where Elisofon’s picture gazes anxiously outward at the origin of the barrage, Bradford’s looks up toward Elisofon’s position and the Santa Ynez beyond to survey the full range of its more immediate effects. One of those effects, somewhere out there in the hills of Bradford’s picture, seen through the infrastructure of oil extraction, was Elisofon and his own activity of photographic survey; his and Morris’ and Life magazine’s own participation in the reordering of the Western landscape, once marked by the promise of American empire, now marked by the fear of another. A concluding note: The Japanese attack at the Ellwood oil field was launched just as President Roosevelt made his first radio address following his December 8, 1941 declaration of war against Japan and four days after he had signed Executive Order 9066, which cleared the legal way for the internment of California’s Japanese-Americans that would begin so soon after. Three years earlier, Roosevelt, an avid collector of war pictures, had published, in a small edition, the treasure of his collection: a portfolio of sketches by artist as gunner William H. Meyers, chronicling the United States Navy’s military conquest of the Mexican territory of California. Until the Ellwood shelling, this was the last time that a foreign power fired its guns on California. We have very little photographic record of that 1846-7 phase of the Mexican-American War, and the sketchbook by Meyers, a gunner on the U.S. Sloop-of-War Dale, is, according to Roosevelt’s own introduction, unique as an eyewitness visual record. 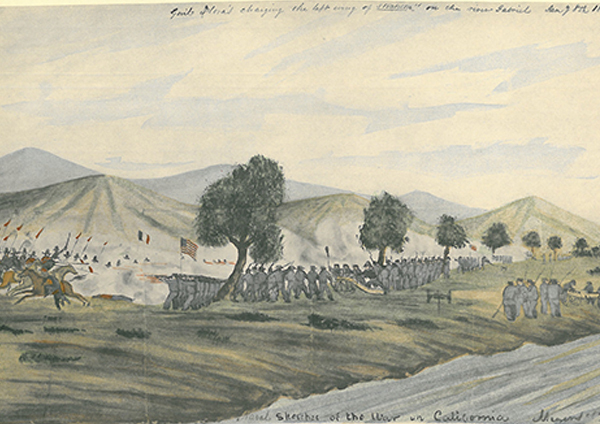 Included among Meyer’s drawings are a number of pictures of the U.S. military’s bloody incursion into Northwestern Mexico, in what is now Los Angeles County. Among these, three, marking incidents on January 8-9, 1847, merit brief mention here. They offer a quick sequence depicting the crossing by US troops of the Rio San Gabriel, their immediate attack on Mexican defensive forces there, and their final decisive assault, the next day, at the Battle for Los Angeles. Taken together, Meyers’ pictures figure a scene not so unlike Bradfords’. Tracing their gaze from a watery position up into the hills, Meyers and Bradford both offer a Southern California landscape scored with the heavy annotation of militarized aggression; Meyers marking progress toward the acquisition of the desired prize, Bradford itemizing violence done against the freshly contested prize-in-hand. But to my eye only Elisofon’s pictures, and especially those that weren’t published, those that we started with here, seem to register something of contingency flagged in the encounter of Bradford’s and Meyers’ pictures; that unstable, almost indifferent correspondence of the landscape to the territory. Thanks to Kenneth C. Hough and Paul Petrich Jr. for sharing their resources and expertise on the history of the Ellwood shelling with me in the preparation of this post. Jason Hill is an art historian based at the Institut National d'Histoire de l'Art, where he is Terra Foundation Postdoctoral Fellow in American Art. His writing on art and photography has recently appeared in X-TRA, Études Photographiques, and Photography & Culture.